With the aftershocks of the global financial crisis continuing to rumble, leaders of the world's major economies have struggled to define a meaningful role for the G-20. Meanwhile, the European Union has been pushed to the limit in efforts to address a gathering debt crisis among members of the eurozone. And the threat of a currency war has strained relations and tested the role of the dollar as global reserve currency. 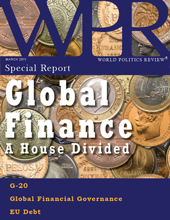 In this special report, World Politics Review considers global finance through articles published in the past year.